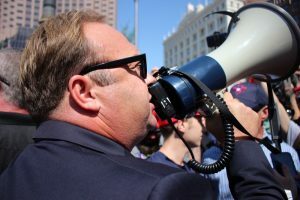 Alex Jones uses a megaphone to voice his opinion as he increases the level of tension between protesters. Conspiracy theorist and host of InfoWars, Alex Jones, was issued a seven-day suspension by Twitter for violating the social media company’s rules against inciting violence. The decision, according to The New York Times, was made after Jones tweeted a link to a video calling for supporters to get their “battle rifles” ready against the media and “fake news.” The one-week suspension will prevent the alt-right radio host from tweeting or retweeting, though he will be able to browse Twitter. The Twitter account for his “Infowars” show was not affected. A conspiracy is a secret plan to achieve a specific outcome. Conspiracy theories originally meant a pre-meditated conclusion, or the idea that an event or phenomenon was the result of a conspiracy. Since the mid-1960s, however, it has often been used to denote ridiculous or irrational speculations. 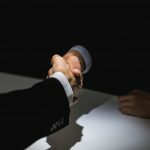 The most dangerous thing about conspiracy theories is the fact that they are almost airtight—because every debunking or piece of evidence against them will be viewed as an attempt to “misinform the public.” The lack of evidence for it is viewed as a government cover-up rather than the logical consideration that the conspiracy in question might not actually exist. Dorsey went on to say that the social media outlet has been consistent in its enforcement of rules in Jones’ case, “while other companies have been a little bit inconsistent.” Not only does the suspension apply to Jones’s Twitter account, but it is also enforced upon his Periscope accounts. Jones, a political provocateur, has been immensely criticized for promoting debunked theories. For example, the far-right pundit said the Sandy Hook Elementary School murders were staged, and that the survivors of the Parkland, Florida, high school shooting were merely just actors paid to put on a tear-jerking show for everyone. As reported by The Hill, Twitter immediately told Jones to delete his offending posts, all of which later disappeared from the accounts days later. Despite the president’s opinion, Alex Jones has been banned from posting on multiple social platforms including Apple, Facebook, and Spotify.